The meniscus is a C-shaped piece of tough, rubbery cartilage that acts as a shock absorber between your shinbone and thighbone. It can be torn if you suddenly twist your knee while bearing weight on it. Each of your knees has two menisci — C-shaped pieces of cartilage that act like a cushion between your shinbone and your thighbone. A torn meniscus causes pain, swelling and stiffness. You also might feel a block to knee motion and have trouble extending your knee fully. Contact your doctor if your knee is painful or swollen, or if you can't move your knee in the usual ways. A torn meniscus can result from any activity that causes you to forcefully twist or rotate your knee, such as aggressive pivoting or sudden stops and turns. Even kneeling, deep squatting or lifting something heavy can sometimes lead to a torn meniscus. In older adults, degenerative changes of the knee can contribute to a torn meniscus with little or no trauma. Performing activities that involve aggressive twisting and pivoting of the knee puts you at risk of a torn meniscus. The risk is particularly high for athletes — especially those who participate in contact sports, such as football, or activities that involve pivoting, such as tennis or basketball. 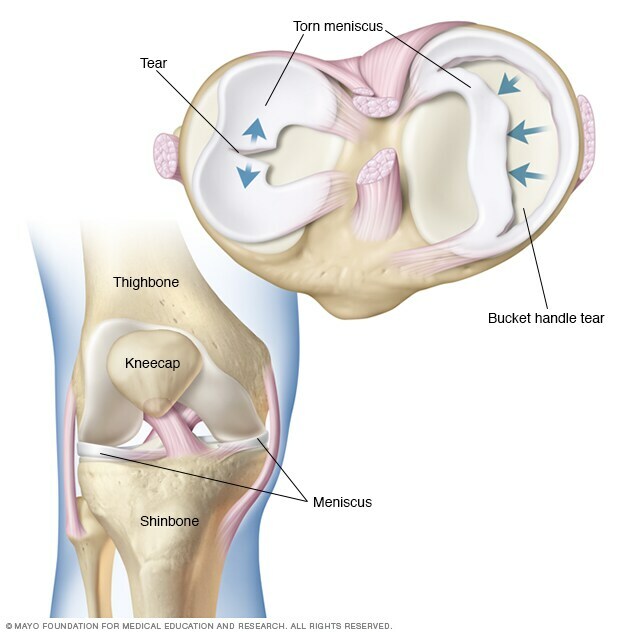 The risk of a torn meniscus also increases as you get older, due to wear and tear on your knees. A torn meniscus can lead to knee instability, inability to move your knee normally or persistent knee pain. You might be more likely to develop osteoarthritis in the injured knee. Cardone DA, et al. Meniscal injury of the knee. http://www.uptodate.com/home. Accessed Sept. 7, 2016. Meniscal tears. American Academy of Orthopaedic Surgeons. http://orthoinfo.aaos.org/topic.cfm?topic=A00358. Accessed Sept. 7, 2016. Skinner HB. Sports medicine. In: Current Diagnosis & Treatment in Orthopedics. 5th ed. New York, N.Y.: The McGraw-Hill Companies; 2014. http://www.accessmedicine.com. Accessed Sept. 7, 2016. Knee arthroscopy. American Academy of Orthopaedic Surgeons. http://orthoinfo.aaos.org/topic.cfm?topic=A00299. Accessed Sept. 7, 2016.